There’s been a lot of excitement about Mars recently, with the news that there’s liquid water and everything. But our next-door planet in the other direction will soon start to get its own share of attention, because the Akatsuki probe is about to make its second attempt at getting into orbit around Venus. For a planet that’s so close by, Venus is really hard to study. Its thick clouds make it tough to see what’s going on down there, and landers tend not to survive very long in the 460° temperatures. We can send probes to visit, but the most recent one, the European Space Agency’s Venus Express, officially ended its mission in December 2014. So we haven’t had any active probes around Venus for about a year, and Akatsuki is looking to close the gap. But why is this the probe’s second attempt to study the planet? Because the first time around, it missed. And ended up going around the Sun instead. Launched by the Japanese space agency JAXA, the probe initially tried to enter orbit around Venus back in 2010. The plan was pretty simple, by spaceflight standards: they’d fire up the main engine and adjust its course until it flew past Venus in just the right way to be captured by the planet’s gravity. But something went wrong. The engine, which was supposed to burn for 12 minutes, suddenly stopped working after only 3. The probe’s main engine had failed — all that were left were secondary engines that were just supposed to stabilize it. But JAXA came up with a brilliant — if risky — Plan B: All they had to do was dump 65 kilograms of fuel, spend the next five years making tiny adjustments to the probe’s trajectory — and then make one really big adjustment at the end. And that big adjustment, a really long engine burn, is coming up on December 7th, when four of the tiny secondary engines will have to fire for 20 minutes straight. If all goes well, Akatsuki will enter a very stretched-out orbit around the planet, taking it within about 5,000 kilometers of Venus’s surface at its closest, but, at its farthest, a few hundred thousand kilometers away. And instead of the 30-hour orbit that was originally planned, this one will take about 15 days, until another adjustment in March shortens it to 9 days. If it works, Akatsuki will spend at least the next two years studying Venus, mainly monitoring its climate. Which is really good news for researchers. Because they’ll still be able to get most of the data they were originally looking for, and maybe even use the probe to finish what Venus Express had started. Using its cameras, Akatsuki will measure different layers of Venus’ clouds, and possibly complete the map of its surface, using infrared light, that was started by Venus Express. It should also still be able to detect whether there’s lightning in the clouds, and if there’s a strong volcanic eruption, which would be exciting, because one of the planet’s biggest mysteries is whether it has active volcanoes. When flying further away from Venus, or about 10 times the radius of Venus from the planet, the AKATSUKI will continuously observe Venus as a whole to understand its clouds, deep atmosphere, and surface conditions. When flying closer to Venus, or less than 10 times the radius of Venus, the orbiter will conduct close-up observations to clarify cloud convection, the distribution of minute undulatory motions and their changes. When the AKATSUKI comes closest to Venus, it will observe the layer structure of clouds and the atmosphere from a lateral direction. The AKATSUKI will also observe to capture the atmospheric layer structure and its changes by emitting radio waves that penetrates the atmosphere of Venus and receiving them on the ground. 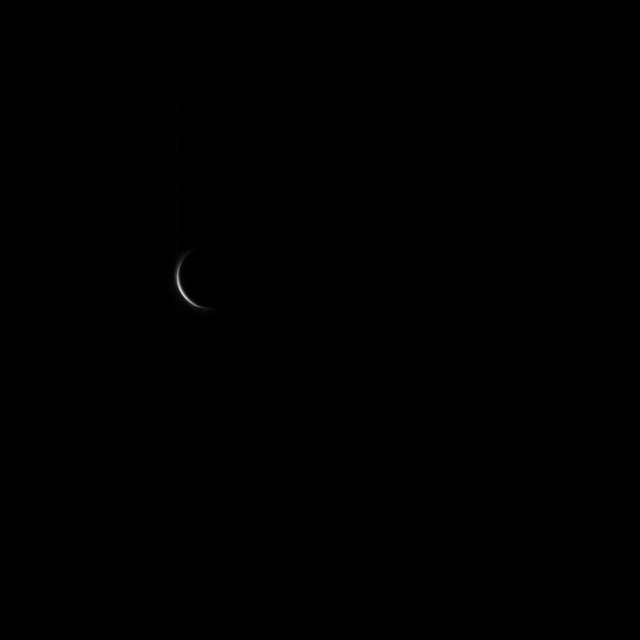 Photo of a crescent Venus captured by AKATSUKI two days after passing Venus in Dec. 2010. Credit: ©JAXA. And! If you want to take a look at the planet while this is all happening, December 7th will be a great time to do it! Because the Moon and Venus will be only a fraction of a degree apart, meaning that you could cover the apparent distance between them with a pinky finger held at arm’s length. The exact timing of this event, known as conjunction, depends on where you live, but you should be able to see the pair almost anywhere in the world, just before dawn on December 7th. And if you live in Alaska or northwestern Canada, you’ll actually be able to see the moon cover Venus! Venus and the Moon tend to pass close to each other about once a month, but the last time they were anywhere near this close was July, and the next time will be in April. So if you want to get a great look at Venus and a sliver of the Moon at once, December 7th is the morning to do it. You should even be able to get the two of them in the same field of view with a pair of binoculars. And don’t forget that even though you can’t see it, Akatsuki is up there too. Go Akatsuki,go! Featured image: Venus Orbiter Akatsuki by Akihiro Ikeshita. Credit: ©JAXA.